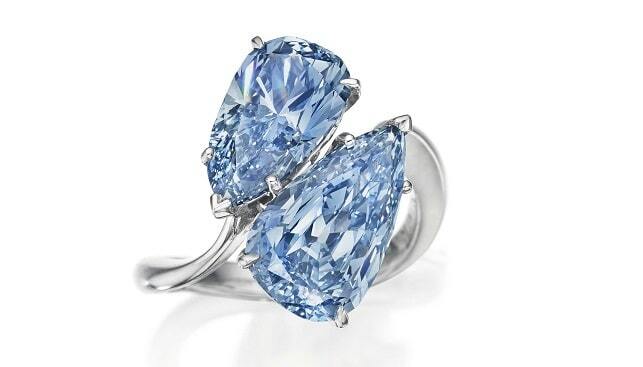 A ring with two fancy vivid blue diamonds by Graff Diamonds was sold for $12.6 million at Christie’s Magnificent Jewels sale in new York last week (December 6) – smashing its pre-sale estimate of $6.5-$8.5 million. Proceeds at the auction totaled $62.6 million. The ring is set with two pear modified brilliant-cut fancy vivid blue diamonds, weighing approximately 3.36 and 2.71 carats, and mounted in platinum. Other headliners, according to Art of Jewellery, included: a cut-cornered, square step-cut, 38.91-carat, D-color, VS1-clarity diamond, which sold for $3.6 million ($93,613 per carat); and a brilliant-cut, 23.26-carat, E-color, VVS2-clarity diamond, which sold for $2.4 million.